Given that the previous two articles today were obituaries, let’s turn our attention now to a legend who’s still alive and kicking — Lee Majors. I was a huge fan of The Six Million Dollar Man when I was a kid and still easily fooled by the fact that his super speed was really just slow-motion running with a “chi-chi-chi-chi-chi” sound effect added. I would run around our living room in extremely slow motion mouthing my own “chi-chi-chi-chi-chi” sound, and in my mind I was running a hundred miles per hour, just like Steve Austin. He was also awesome in The Fall Guy as crime-solving stunt man Cole Seavers. Those were the days, weren’t they, when a concept like that could not only get made into a TV show but last 112 episodes and be amazing? 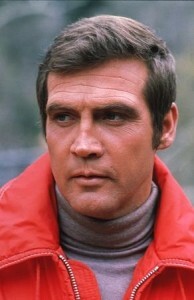 By comparison, The Six Million Dollar Man lasted for 98. I still think my favorite Lee Majors moment is in the Bill Murray Christmas classic Scrooged, in which Lee Majors plays himself (with a Gatling gun!) in the movie-within-the-movie, The Night the Reindeer Died. When he shows up to rescue Santa and Santa declares “It’s Lee Majors,” I crack up every time because they call him by his real name, as if Lee Majors were the action hero instead of his character Steve Austin. It’s not like it isn’t deserved. Anyway, one of my favorite new sites, Hero Complex, has an awesome new interview with Mr. Majors about his experiences and his career. If you’re my age and you remember being mesmerized by his televised exploits as a kid, check it out and prepare to smile a lot.